Mincemeat Muffins are the best recipe to bake during the cooler Fall and Winter months. 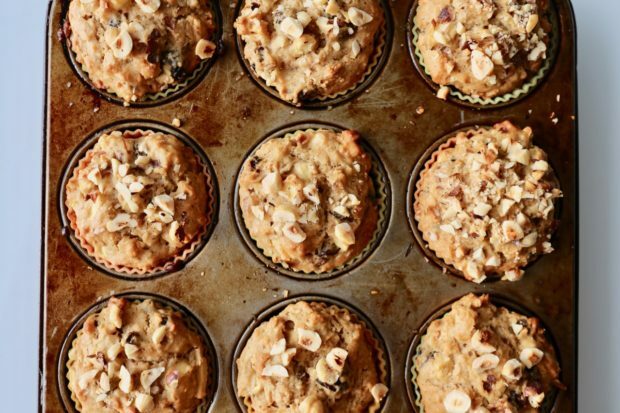 These easy Christmas muffins feature festive spices, sweet apples and roasted hazelnuts. Mincemeat Muffins are our favourite Christmas baking recipe, offering a great way to use up leftover mincemeat after the holidays. It’s important to note that mincemeat does not actually include meat. It is often prepared with suet (beef fat) or butter. We’ve included instructions on how to make vegetarian or vegan mincemeat, which you can also use to prepare these delicious Mincemeat Muffins. After making Mincemeat Muffins your kitchen will smell like Christmas! Mincemeat is a mixture of chopped dried fruit, distilled spirits, spices and sometimes beef suet. Mincemeat was first mentioned in English recipes starting in the 15th century. In these historic recipes, British cooks and bakers described a mixture of meat and fruit used as a pie filling. These early recipes also included vinegars and wine, but by the 18th century, distilled spirits, frequently brandy, had popularized. Mincemeat is typically spiced with clove, nutmeg, mace and cinnamon, which were popular flavourings for meat dishes in the late Medieval and Renaissance periods. The increase in sweetness from added sugars, and those produced through fermentation, made mincemeat less a savoury course and helped direct its use towards the dessert table. Mincemeat is most frequently consumed during the Christmas holiday season. In the northeast United States, mincemeat pies are also a traditional part of the Thanksgiving holiday spread, often served with a slice of cheddar cheese. Mincemeat Muffins are an easy breakfast or a mid-day snack enjoyed at tea time. Our Mincemeat Muffins are best enjoyed during the Fall or Winter when everyone is in the festive mood for apples, nuts and spices. Mincemeat Muffins topped with chopped hazelnuts are ready to go into the oven. You’ll want to use a high quality mincemeat to prepare our Mincemeat Muffin recipe. You can opt to make homemade mincemeat at home or purchase a jar from a popular brand such as Crosse & Blackwell. 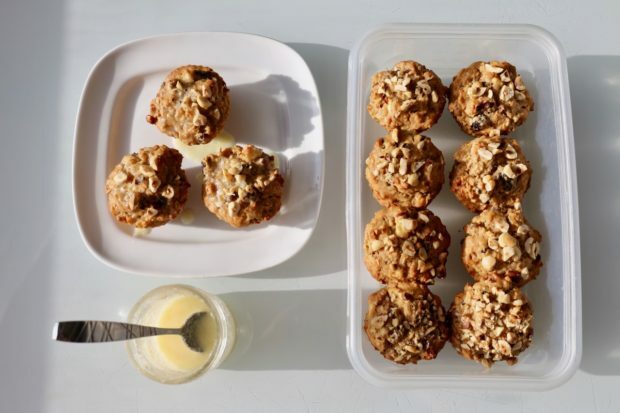 Making your own mincemeat at home is a fun way to personalize the mincemeat in these muffins so they’ll be geared to your taste. Some people are very particular about what dried fruits they enjoy. If you hate apricots swap them out for dried cranberries or currants. There are also a variety of vegetarian mincemeat recipes for those who don’t eat meat. Double or triple the recipe and you can scoop your homemade mincemeat into jars and offer them as Christmas gifts to your friends and family. Mincemeat Muffins fresh out of the oven. Once you’ve mastered classic Mincemeat Muffins have fun in the kitchen by getting creative. Mincemeat Surprise: if you want to give your guests an extra surprise, make a mincemeat centre for your muffins. 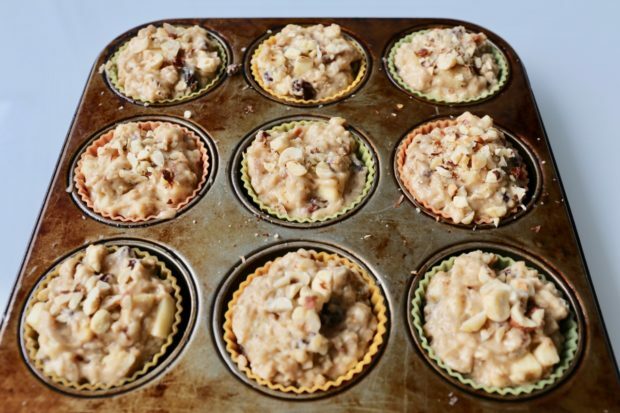 To do this, add 1/3 cup of batter to the bottom of a muffin cup, then add a tablespoon of mincemeat. Top off your stuffed Mincemeat Muffins with the remaining 1/3 cup of batter. 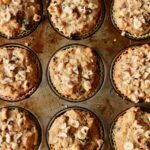 Get Nutty: feel free to swap out roasted hazelnuts in your mincemeat muffin recipe for other popular nuts such as pecans or walnuts. Cheerful Cherry: if you’re making these muffins during the Christmas holidays swap out the apples for 1/2 cup of coarsely chopped glacé cherries. Add equal parts green and red cherries and your guests will be delighted by each festive bight. Lemon Glaze: once your Mincemeat Muffins have cooled you can transform them into a celebratory dessert by dipping in lemon glaze. In a medium bowl whisk together 1 cup icing sugar with 2 tablespoons lemon juice and the zest from one lemon. Turn your Mincemeat Muffins into festive cupcakes by topping with sweet lemon glaze. Mincemeat Muffins are our favourite Christmas baking recipe, offering a great way to use up leftover mincemeat after the holidays. Preheat oven to 350F. Spray a muffin tin with cooking spray. In a small bowl let oats soak in milk and Greek yogurt for 30 minutes. Whisk flour with baking powder, allspice and salt in a small bowl. Reserve. Whisk sugar and canola oil together in a large bowl. Whisk in egg and almond extract. Add flour mixture and oat mixture alternately, stirring gently until almost incorporated. Fold in mincemeat, apple and hazelnuts. 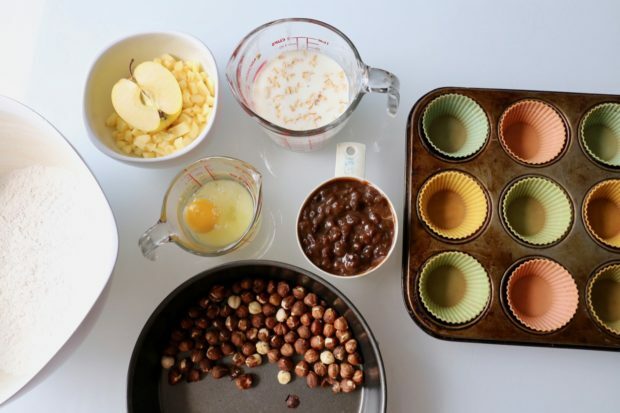 Fill muffin cups almost full and bake for 30 minutes, or until golden brown and springy to the touch. Cool in pan on a rack 10 min. Serve warm or freeze remaining Mincemeat Muffins in an airtight container for up to two months.